The Food and Beverages industry is one of the most lucrative industries in the UAE. People with high living standards, presence of large number of foreign citizens and incentives provided by the UAE government are few of the reasons behind booming of food and beverage industry in UAE. Recently, there were few concerns about openings of large number of restaurants in the country but there are still several opportunities in this highly profitable business in UAE. A report by CBRE shows that food and beverage industry is immensely boosting the retail sector of UAE. Local people of UAE and also foreign citizens are helping the growth of the food & beverage sector in UAE. 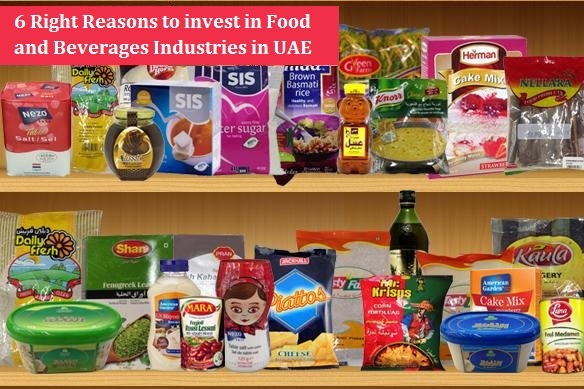 Following are the 6 right reasons that will persuade you to invest in the food and beverages business in UAE. According to a recent report, the citizens of UAE are third in the list for spending most on food and beverages while the only purpose of 60% of visitors of a mall is to eat or drink. The report clearly reveals the fondness of the citizens of UAE to spend heavily on food and beverage items which is a clear indication of chances in the increase of profit in the food and beverage sector in the country. These local consumers especially love healthy as well as new and exciting concepts of food. These local consumers indicate the basic attraction in the establishment of business related to food and beverages industry in UAE. UAE is one of the most favorite holiday destinations for people all around the world while the country also provides best business opportunities for foreigners. Every year, thousands of tourists from all around the globe visit UAE to spend their holidays in the beautiful and tourist-friendly environment of UAE. An important attraction for these foreign visitors is the delicious food available in UAE. These wealthy foreign visitors spend large amount of money on these food & beverage items that results in the immense increase in the profit of food and beverages business. An important aspect is that these foreigners visit UAE in every season which makes it a profitable business in every season of a year. Free zones are excellent places for foreign investors where they are provided with 100% business ownership along with exemption from taxes and duties. All these incentives offer best opportunity for investors in food and beverage industry to set up their business in UAE. The combination of food loving population and tax free business is the clear indication of possibility of growth in the food and beverages industry especially when its set up is in the free economic zones of UAE. Many oil dependent countries are facing economic issues due to current reduction in oil prices but it is not an important issue for UAE. It is because the UAE government depends less on oil and petroleum due to huge foreign investment. The reason behind this foreign investment in UAE is the opportunities and incentives provided by UAE to foreign investors. One such incentive is the simple licensing process and business registration for investors to establish their business in UAE. You can use this easy licensing and registration procedure to establish food and beverage related business in the form of branch of a local company, branch of a foreign company, Limited Liability Company and Free Zone Company. As stated above, UAE is a loving place for people all around the world. There are people from wealthy countries along with large number of expatriates from low income countries of Africa, South Asia etc. This provides another good opportunity to invest in the food and beverages industry in UAE. The investors can not only establish food business of various types like Chinese foods, Indian foods, Western foods, Arabian foods etc. for people of various geographical locations but they can also expect profit from the food business either it is established for wealthy foreigners, taste-loving local population or low income people of underdeveloped people because all these people are present in large numbers in UAE. Geographically, UAE is a barren desert which means the country depends heavily on imports of fruits, vegetables and other food commodities to fulfill the food requirements of its local and expatriate population. This provide a large opportunity for traders of fruit, vegetables and other important food commodities to set up their business in UAE and then import these food items for people of UAE. Due to the incentives provided by UAE government, the businessmen can earn a healthy profit only by importing food commodities for UAE. There is no worry of loss or less profit in this business related to food and beverages because fruits, vegetables and other such food commodities are basic human necessities.